Action of opiates on gastrointestinal function. Opioid peptides and opioid receptors are distributed along the gastrointestinal (GI) tract, indicating endogenous opiates released peripherally may modulate GI motor and secretory functions. Animal studies have revealed that the effects of opiates on gut motility depend on the nature of the subclasses of receptor involved, the species and the part of bowel. Most opiates that have a selective or predominant mu agonist activity inhibit gastric motility and delay gastric emptying by acting centrally; delta and kappa agonist are inactive when injected systemically. The effect of opiates in delaying intestinal transit observed in man, rat and other species is related to an inhibition (rat) or a stimulation (dog and man) of intestinal contractions as premature phase III-like sequences. 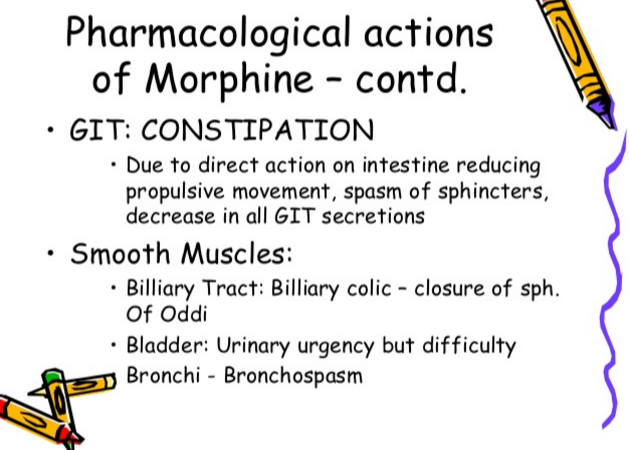 The constipating effects of morphine probably result mainly from its action on colonic motility. Morphine stimulates colonic motility in humans by action on both central and peripheral sites. This increase in colonic motility and the delay in colonic transit is associated with a reinforcement of tonic contractions and reduced propulsive waves. Opioid peptides have been shown to participate in the colonic motor response to eating in man and animals. Both delta and mu receptors are involved in the stimulatory effects of opiates on colonic motility, while kappa receptors inhibit colonic contractions, mainly by acting centrally. The effects of opiates on gastric acid secretion are still controversial but it has been well demonstrated that opiates act centrally to reduce pancreatic secretion in rats. opiates also inhibit intestinal secretions via an action on the enteric nervous system as well as in the CNS. All these results reinforce the hypothesis that opioid peptides have a major physiological role in the control of gut motility and secretions, and these actions explain most of the pharmacological effects of opiate substances on the digestive tract.